Created in Craftartist using images from Cupcake Crafting's Walk on the Wild Side CD. Hi Caroline, this is so lovely, i love that image and the way you have used the smaller ones looking at each other just beautiful. Hi Caroline, good to see you joining in with us again. This is a super take on our sketch challenge, lovely image and I like how you have done the layout. Good card, I really like giraffes although they can be a bit overpowering when they lean over and lick you! Yes it did happen at Chester Zoo. Lovely colours and a great take on the sketch, I think I'm going to enjoy this week. thanks for joining us once again at CD Sunday. Oh this is fab Caroline. I don't know what inspired you to use giraffes for the sketch but I'm so glad you did. Beautiful images and I love the spotty card candy. Thank you for joining in the CD Sunday Challenge this week. 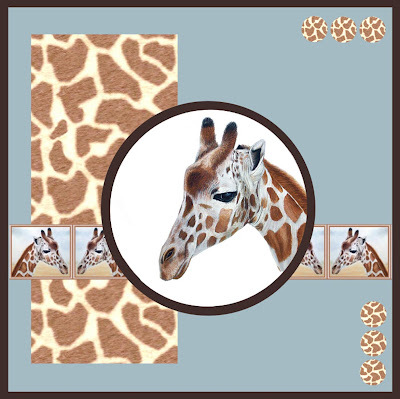 I love giraffes and your card is beautiful, love the card candy.